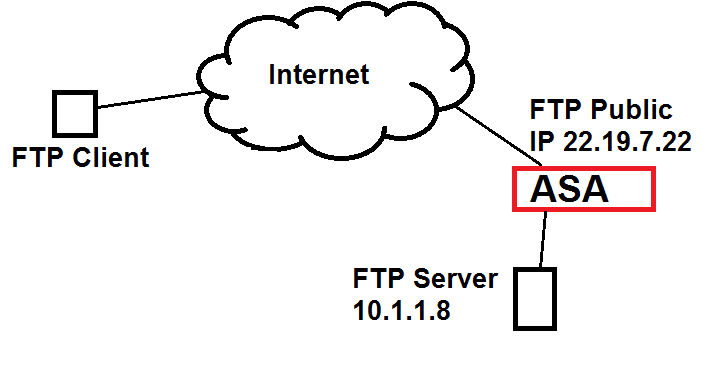 I was asked by one of my customers to configure the Cisco ASA firewall to allow FTP traffic to their FTP server internally. Below is the topology and the config I put in. This is for the 8.3 code and higher. I think I had 9.1 on this one. I highlighted the notes so that you might know the commands purpose. Very nice. Will this config handle both active and passive modes, or does that require any kind of "fixup" to be applied? Good question. The customer had not said anything to me about it. But I'm thinking it's for active only. I think for passive to work, you would probably have to do a "inspect ftp" on the default policy, which I didn't do, I'm sure. But, I think it's on by default in the default policy.